A photographic essay on why Lu Zhaoyao (played by Bai Lu) from The Legends 招摇 is Elphaba. update: this is only true up to when she explodes the first time. After that, the series goes into original content and all consistent characterization and plot also explode. Featuring two female leads with character flaws and character growth, The Legends has one of the best written female friendships of late. 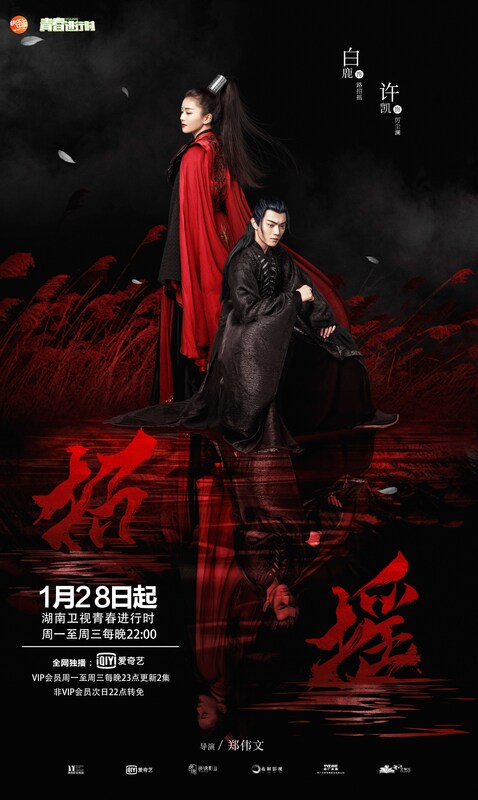 The Legends 招摇 might be the best wuxia-ish drama with a female lead out yet (I know, low bar), and the three leads might have my favorite drama lead dynamic since The Disguiser. The currently-airing drama is still a funny, cute rom-com at heart, but it’s one of the few wuxia that treats its female leads’ ambitions no different than a male lead. It reminds me of Wicked the musical with its polar-opposite female leads who share a room and who change each other for good. One of them is pushed into wickedness after being called so by the leader of the land, but the other believes in her even after the world has deemed her wicked. The romance plot reminds me of The Disguiser, with the male lead being in love with not just the female lead but her visions for the world. update: You should stop watching the moment Zhaoyao explodes because that is when the series also explodes as they go into original content. Everyone becomes out of character and the plot is a mix of cringe+boring+??? after that. Zhaoyao (Bai Lu) starts off as a young girl fed naive visions of helping her people “become good” by her mentor and first crush. Yet when he condemns to death an innocent youth prophecied for evil, she is horrified and rebels against him. Her mentor ends up killing her grandfather while she saves the youth. After being told repeatedly she’s wicked by everyone, Zhaoyao chooses to become wicked. She sets out to build a ruthless empire, killing both her mentor and her old dreams along the way. Five years later, the “righteous” sects gang up on her and she is killed. The youth she saved, Li Chenlan (Xu Kai), takes over her sect and rebuilds it in her original vision. When she magically returns from death, she finds that her acres of traps and torture equipment have all been converted to pastures and tools for the villagers. Enraged by this sign of betrayal, she goes back to her sect undercover and spends every day trying to seduce and/or kill Li Chenlan. All this happens in the first five episodes! Zhaoyao: Who would be so shameless as to want to care for the most wicked person alive? Zhiyan: I’m that shameless.